I've been so excited to try out all the compostable products out there in my compost pile and see how they really break down. I'll be continuing to review and add products to this list and give you all "the dirt" on compostable products. This is a real review for my fellow composteurs and friends in my compost club. I'm not getting anything from the companies that I am reviewing (although I would happily accept free samples!). These are my authentic opinions. These straws are made from PLA, or corn plastic, and break down in compost piles that reach temperatures of over 140 degrees. These are perfect for businesses that are making the switch to composting. These straws are made from 100% biodegradable wheat stems! What a perfect party straw. We use these bamboo straws in our home for everyday kid use. Bamboo is naturally antimicrobial and these will last for several drinks. Once they seem worn out we simply throw them in the compost pile. I love these bags. These are for compostables, not garbage, so make sure you use them accordingly. They are not super strong but are stretchy and they work great for bagging compostables. When they hit the compost, they break down fast into a gooey gel and biodegrade in just a few days. These paper plates are economical and break down great in the compost pile. 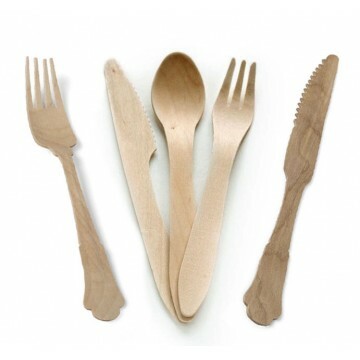 Check out these all-in-one cutlery packages that are 100% compostable! Share these with your caterer for your next event and let all your guests know how awesomely zero waste you are. Leafware utensils are made from 100% natural & sustainable birch wood. These are stylish and biodegradeable, and pretty reasonably priced at $14/100 count. This is definitely a great option for a zero-waste party. How cool are these scour pads, made 100% from walnut hulls! Totally sustainable and biodegradable. Available at Thrive Market. This is one of my favorite products and companies. We subscribe and receive by mail laundry detergent and dish detergent pods. Their packaging is 100% compostable so this is truly a zero waste product, and their detergents are enzyme-based and biodegradable. They also just happen to be incredibly convenient too. Subscribe and have them delivered right to your door! I am really excited to discover these toothbrushes. They and their packaging are 100% compostable and a four-pack on Amazon is 10.97, or on 11.97 directly from the Wowe website (which is a pretty awesome resource for compostable products!) Bamboo is apparently naturally antimicrobial (good news for the straw too) so totally a fine material for toothbrushes. These are simple take-out boxes, but they are also great for home use. These cups are made from PLA, a corn derived plastic, and will break down in compost systems that reach temperatures of over 140 degrees. We are happy to report that these are actually breaking down in our compost piles and we are accepting them in our compost bins. I have used this product for years in my gardening with children activities, and I am a huge fan. Simply wrap strips of newspaper around the pot-maker to craft little paper pots that are ideal for starting seeds. Transplant the seedlings in their pots directly in the garden and let the pot decompose naturally. This pot-maker is available from Gardeners.com for $10.89, and it makes infinite paper pots.